The weather in Middle East is diverse and pleasant in a way that you can swim in Dubai in winter and enjoy the Sahra tour at nights and also enjoy the pleasant weather and star full sky. You can take a flight which lasts less than an hour to travel to the snowy Zagros and enjoy the developed facilities and fascinating sky resort of Pulad Kaf. This tour would be your best choice in autumn and winter as it provides you with the diverse sights of nature and also the historical monuments of Dubai and Shiraz. Day 1: Arrival in Dubai airport. Meet and transfer. 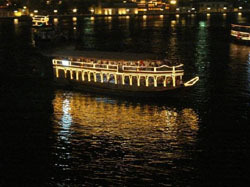 Visit Dubai and at night cruise on a dhow. Dubai is a beautiful city neighboring Oman, which a bay divided it to two equal parts. These two parts adjoin each other with large bridges and beautiful subways. Should you choose to go on Desert Safari, your tour will depart in a 4x4 or hummer, traveling across the dunes in the early afternoon. There will be several photo opportunities at planed stops along the way to the first destination, a traditional camel farm. 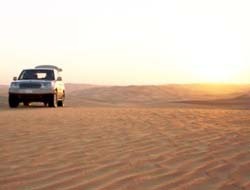 Your drive will continue crossing the desert where you will witness the beautiful sunset over the dunes, one of the highlights of the trip on Arabian safari. Upon arrival at the campsite, you can choose to ride on a camel, experience the thrill of sand boarding, or try out a henna design on hands or feet before enjoying a delicious BBQ dinner and fruity aromas of the famous shisha (Arabic water pipe). Then you can sit back, relax and experience the delights of the belly dancing performance by the campfire beneath the stars (year-round except Ramadan). Day 3: Beach tour and shopping. 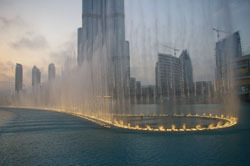 In the evening visit Jumeira City and take part in the water dance show near Khalifeh tower. In the Morning start from the iconic Grand Jumeirah Mosque and work your way down on foot enjoying the sunshine and fresh air as you stroll moreover you can also rest beside beach and have fun. In the evening you will visit Jumaira City. This award-winning resort hotel has 26 stories comprising 617 sea-facing rooms, suits and villas. Retail shops include sports and leisure, carpets, pharmacy, caviar, photo developing, jewelry, electrical items, clothing and newsagents. There are also 22 cafes cafes, restauranrs and bars. Business guests and couples travelling alone have access to the new stylish club Executive Lounge providing a convenient meeting place offering breakfast, refreshments and sundowners. There’s a haven where executives can hold informal meetings or simply reflect on their day. Day 4: Fly to Shiraz airport. Meet and transfer. Visit Shiraz. We will be transported to the airport for an hour flight to Shiraz. This is followed by a transfer to our hotel in Shiraz. Sa'adi and historical sites from different eras stretching back 6,000 years ago can be found. Early in the morning, relish in the highlights of Shiraz when it was the capital of Iran during the Zand Dynasty. Be inspired by the glorious Karim Khan palace, the splendid Vakil mosque, Vakil Bazaar and Saray-e-moshir with its splendid architecture and interesting ethnic souvenir shops, Nasir Almolk mosque. Next, we will stop for a mouth-watering Iranian lunch at one of the traditional restaurants of Shiraz. In the evening, we will visit Ali-Ebn-e-Hamzeh and be prepared to marvel at its beauties. Take a stroll through the Jahan Nama Garden and witness its tall and proud cedars. Not forgetting the two famous Persian poets, hafez and Sa'adi, whose mysterious poems are everlasting in the Persian language we will get a chance to pay homage to their tombs. 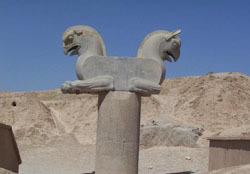 Day 5: Visit Persepolis and Necropolis. In the afternoon Shiraz city tour. Be prepared to be inspired by the magnificence of Persepolis. This gem of ancient Persia which dates back 2530 years ago is the result of the exquisite works of a conglomeration of fine artists and architects from various nations under the Archaemenid Empire. Next, we will visit Koh-e-Rahmat which is sided east of Persepolis and considered as a sacred mountain in ancient Persia. Followed by Necropolis where we will marvel at the massive tombs of Old Persian kings. Necropolis is a collection of a variety of awe-inspiring historical relics from different pre-Islamic eras. Finally in the afternoon its time for shiraz city tour so we visit the Delgosha Garden and Khajoy-e-Kermani tomb from where the perspective of the mysterious city of Shiraz will perpetuate in our mind. 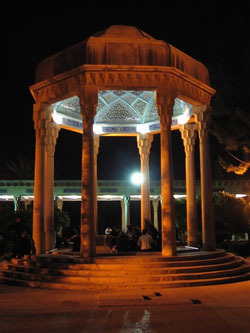 At night have dinner in a restaurant with specific atmosphere in the north of Shiraz.Stay overnight in Shiraz. And en route we will be able to see the Shah-Cheragh (King of the Light) shrine from outside. Stay overnight in Shiraz. Stay overnight in Shiraz. Day 6: Visit Pouladkaf complex, use Gondola lift and ski slope. Climb the mountain for 2 hours to reach the 3600m high lake of Barm-e Firouz. Stay overnight in Pouladkaf hotel. 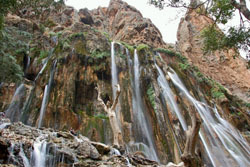 Day 7: Visit Margoon waterfall. Drive back to Shiraz.